More than 10,600 students took their first steps toward their bright futures as they completed their CSUN degrees. Families and friends turned out for the various ceremonies that included the bestowing of an honorary Doctor of Fine Arts on acclaimed film director Robert Townsend and an honorary Doctor of Humane Letters on former Los Angeles County Supervisor Zev Yaroslavsky. 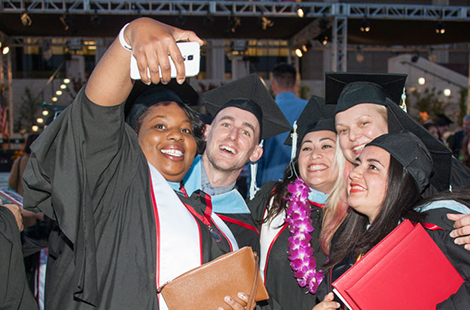 Read more about CSUN Commencement 2015. A group of CSUN physical therapy students was honored at Dodger Stadium for being recipients of scholarships from the Los Angeles Dodgers Foundation and Roy and Roxie Campanella Foundation. Also honored on this evening was Adam Moore, a CSUN physical therapy student invited to intern with the Dodgers during Spring Training. Read more about the Dodgers and Campanella PT scholars. The LACI@CSUN firm Pick My Solar has been named this year’s Outstanding Small Business by the U.S. Small Business Administration's Small Business Development Center. Read more about Pick My Solar and alumnus Max Aram. Thu., June 4, 6:30 p.m. Sat., July 11, 8 p.m.
CSUN is on the road to the exclusive Annenberg Community Beach House to connect with area alumni. Bring your questions and your business cards and join us to mingle with new clients, find career or business connections, and learn what’s new at CSUN. Join CSUN alumni and friends for a night out with the Boys in Blue! Dodgers vs. Cincinnati Reds. Copyright © 2015 California State University, Northridge. All rights reserved.